This post is sponsored by Calico. 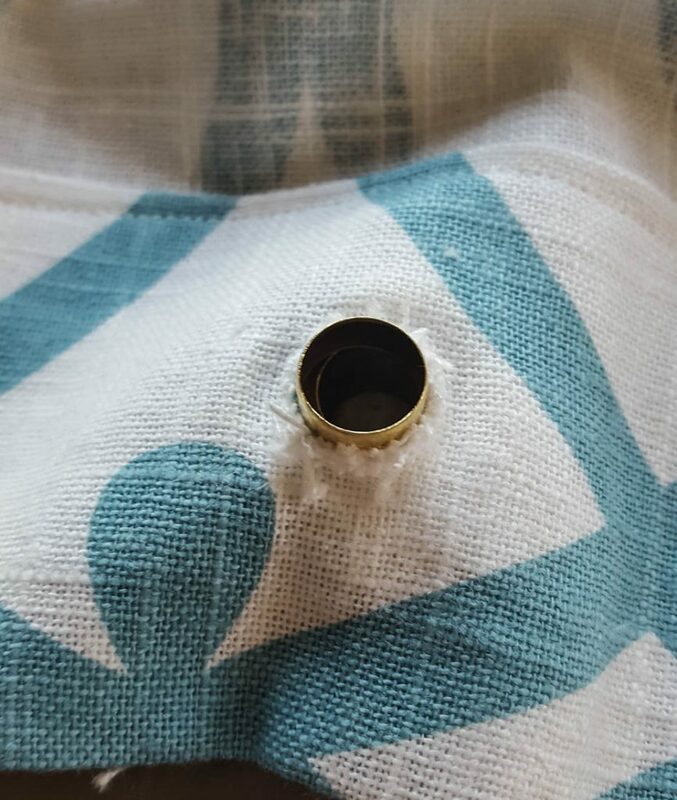 I thought it was time to step up my shower curtain game, so here we go with this tutorial for a shower curtain with grommets. I think you need to be careful when choosing a fabric for your shower curtain. You don’t want a small pattern with a short repeat. I think it won’t feel like it is the correct scale. 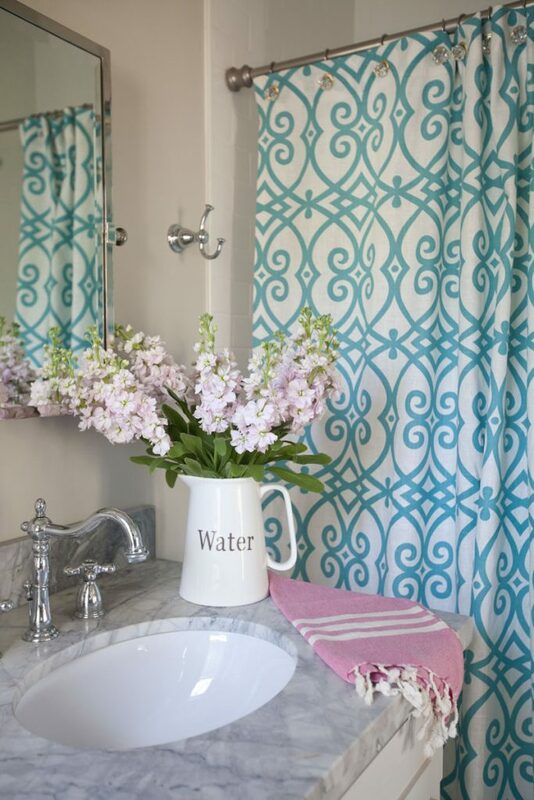 Think of the shower curtain being like a window curtain. You want a large scale pattern or no pattern. 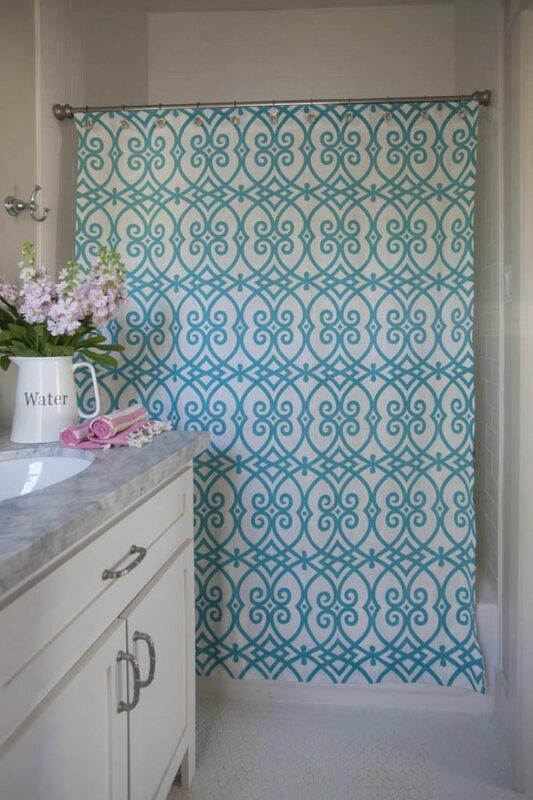 This bathroom is rather neutral, so I thought a beautiful, bold, large-scale print would be perfect. This fabric is called Jaclyn Smith Aparna in color Peacock. You’ll want 5 yards of fabric for this project if there is no pattern. If there is a pattern, ask for the repeat information, since you will probably need more than just 5 yards. 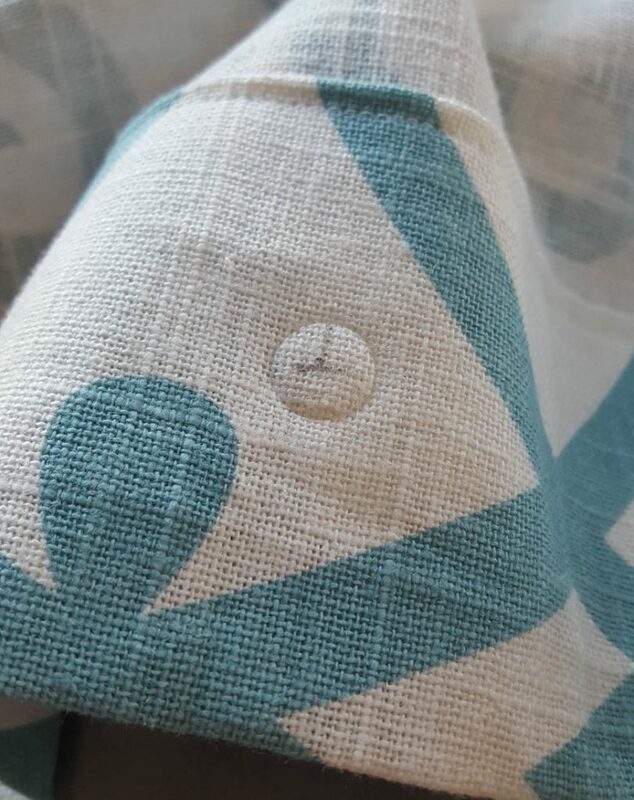 You want the pattern to line up when sewing. The finished size will be 72 long by 72 inches wide. Looking for a unique nightstand? We’ve got you covered in this episode of Decorating Tips and Tricks. 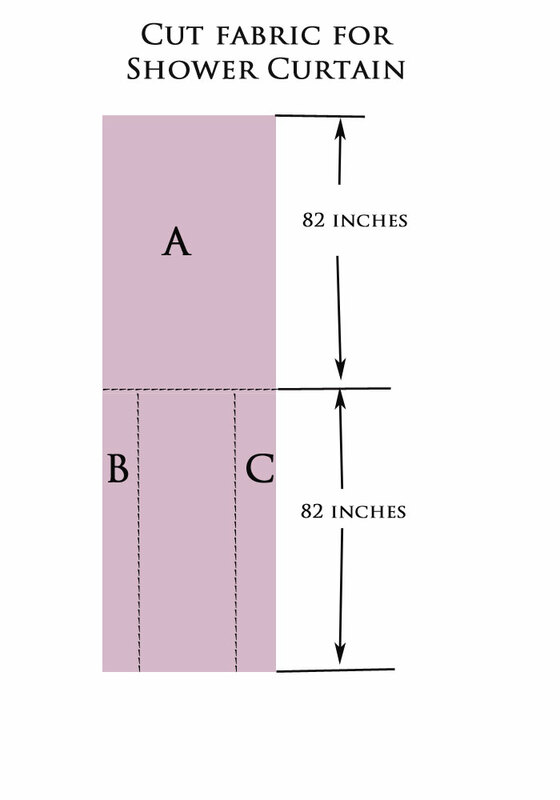 Cut one length of the fabric at 84 inches. Then cut two pieces 12 inches by 84 inches. Cut when needed so that the pattern will line up when sewn together. Then sew pieces B, A, & C together as shown. Next press open the seams. 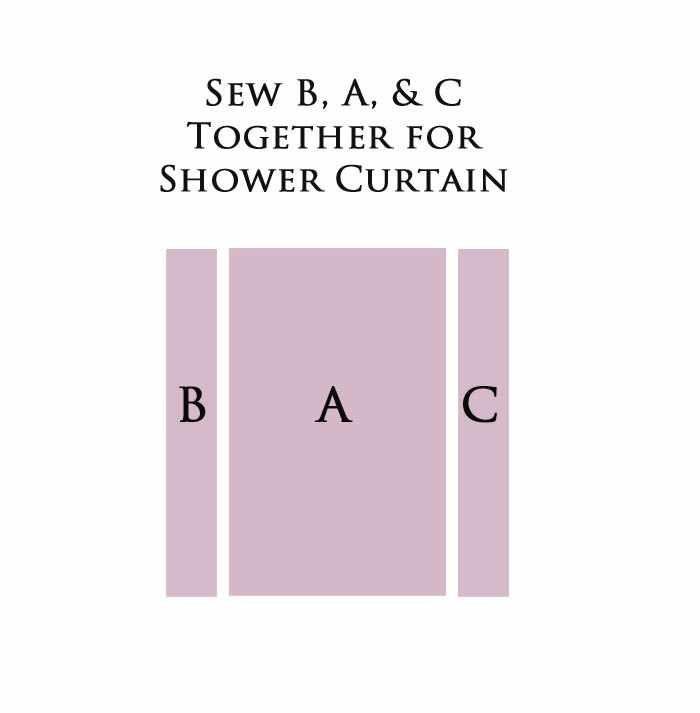 Now finish both sides of the curtain, by pressing over one inch, then press over another inch. Sew hem in place. Do this on both sides. Then press over a hem at the top by 3 inches, then do it again another 3 inches. After pressing with your iron, so that hem in place. that will be the top of your curtain. At the bottom of the shower curtain, press a 3 inch hem, then turn it over again and press it again. Sew the bottom hem in place. We are a participant in the Amazon Services LLC Associates Program, an affiliate advertising program designed to provide a means for us to earn fees by linking to Amazon.com and affiliated sites. This post contains affiliate links. Use protective eye gear, ear plugs, and possibly gloves for this project. I chose to use grommets, but you could sew button holes at the top instead. There are many ways to add the grommets. 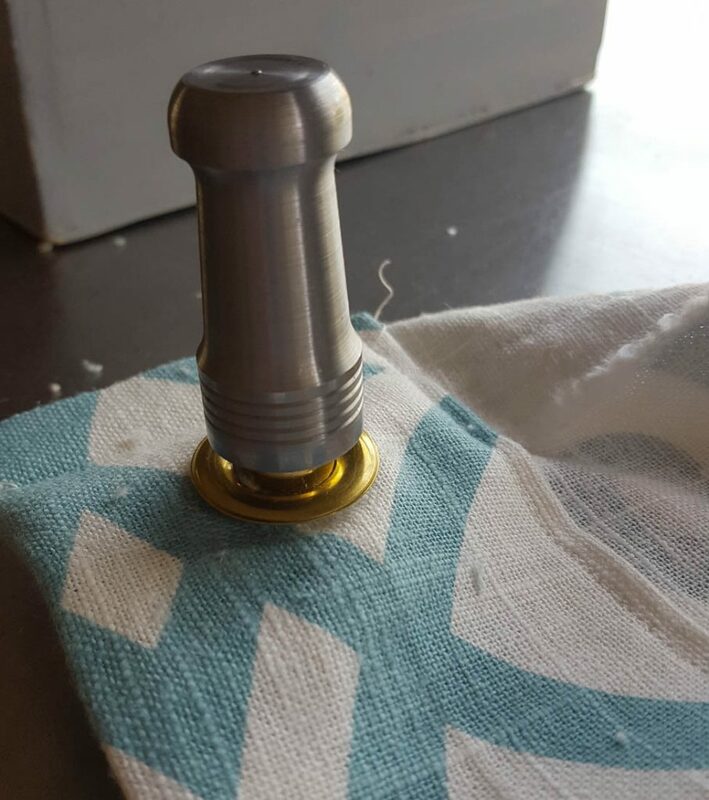 I used a 1/2 inch grommet kit that requires a hammer, CLICK HERE. It was cheap, but you do risk hitting your thumb. 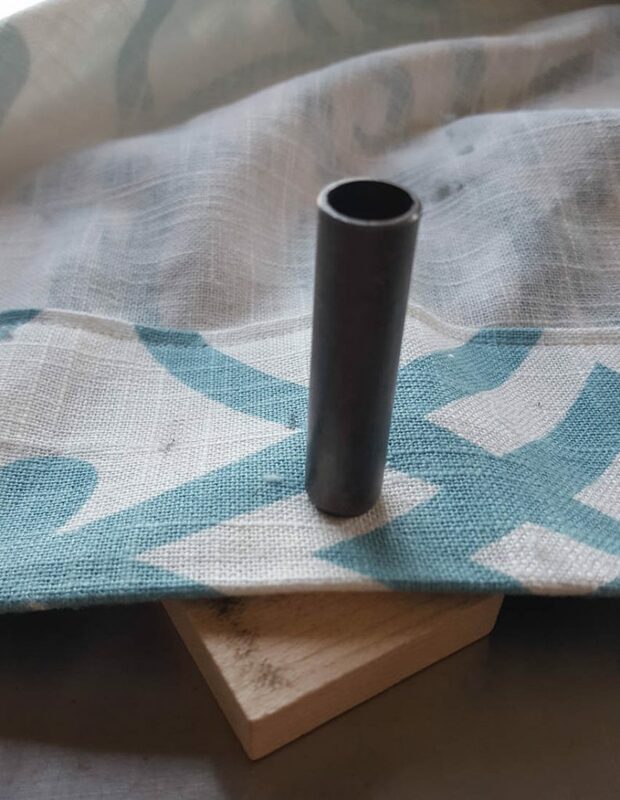 You might prefer this grommet press, CLICK HERE. 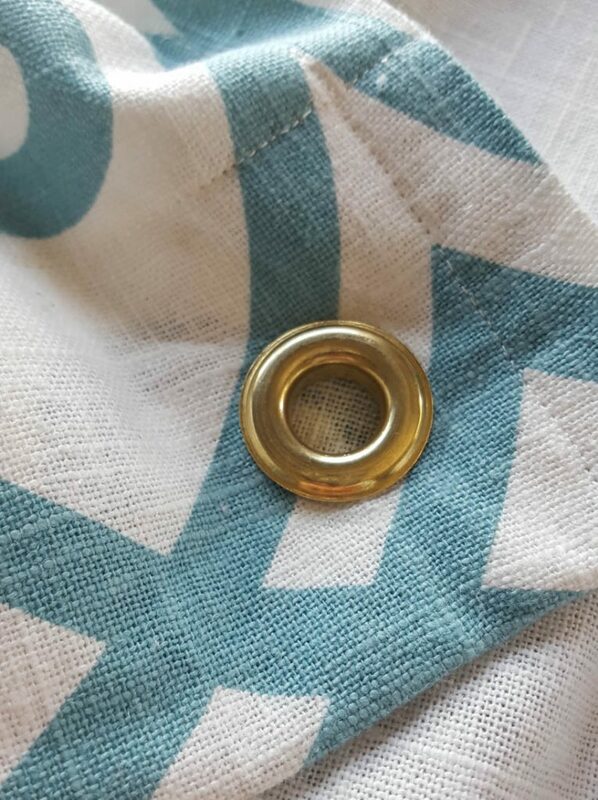 About 1 1/2 inch from the top of the curtain, measure one inch in from each side, mark this places for grommets. There are 12 grommet holes needs. Measure so that they are evenly spaced apart, all 1 1/2 inch from the top. Where you marked the place for the first grommet, place the cutter on top of the fabric and the wood block below it. Hit it with the hammer. 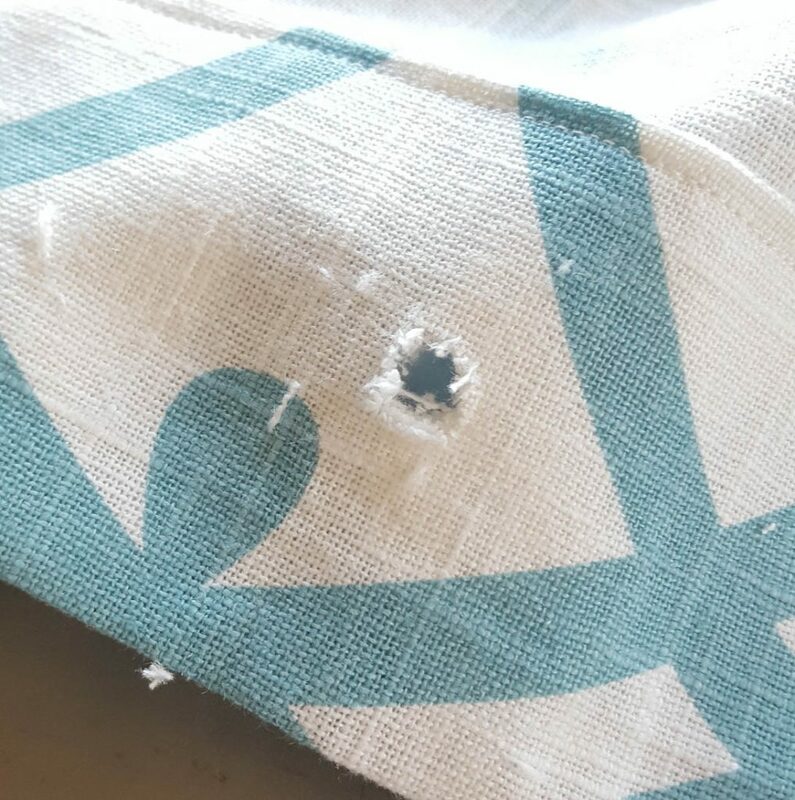 Since I had 3 thicknesses of fabric, the punch did not create a hole in my fabric, but it did mark where the hole should go. You can see the mark it made. I used scissors to cut a hole in the fabric. Then I inserted the grommet from the right side. Next, I placed the washer on the wrong side. Lastly you place the base under the grommet, and insert the handle into the grommet tube. This is where you hit it several times with a hammer. You have to be very careful not to hit your hand. That is why I prefer the grommet press, since it does not require use of a hammer. I never got the grommets super flat, so if I do this again, I will definitely buy a grommet press. And here is the curtain. My curtain is just 54 inches wide, since it is going to go in a small shower (not where I have shown it). Yours should be quite a bit wider than this one, and will be a bit fuller. I want to note that the grommets won’t work well with some of the curtain hooks, so beware. If that is an issue, then you can always use button holes instead. Great idea for those tub/shower combos, and you just can’t find one you like. Or you want it taller, or fuller. Great tutorial Anita! 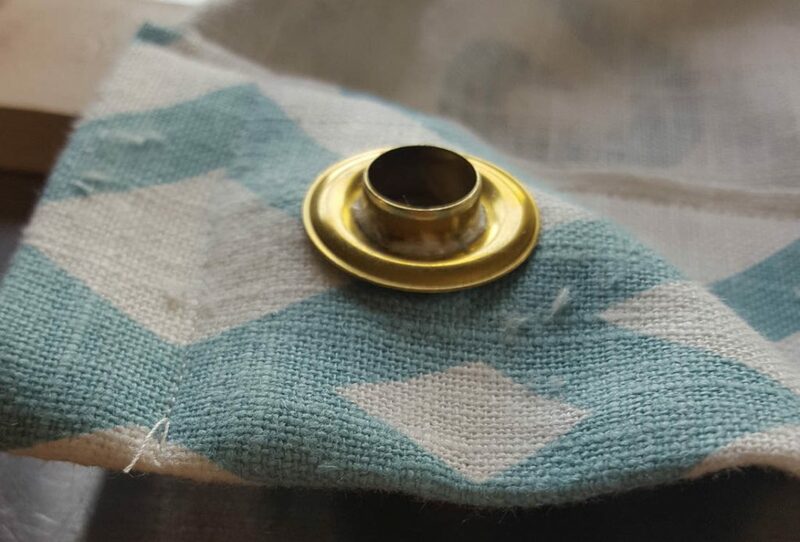 Great tutorial and what beautiful fabric, ….love, love it! Thanks Anita. Great tutorial. I’m redoing our master bath and this will be a huge help in sewing a shower curtain. I love the sparkly shower curtain hooks. One can never have enough sparkle! Thanks for the tutorial! If I need an extra long shower curtain, what do I do about liner the same length? You are one talented lady. Love your easy instructions. Love your fabric. The tutorial is very detailed. Do you put a liner behind the fabric? Very pretty !! !Great tutorial,Anita!! I really like the fabric! !